Rebuildable Drip Atomizers, or RDAs, have remained popular in the vaping community, even as devices have come around offering more convenience and simpler use. When electronic vape devices were still a new and relatively unknown technology, they were largely inaccessible to nicotine users who don't have much technical prowess or training. Many devices were custom-built, and could be very dangerous if designed & assembled by someone who didn't know what they were doing. These days, vaping tech couldn't be simpler. In most cases, you fill up your tank, press a button, and your device produces that delicious vapor. Many vapers, however, still insist on the old, manual style of applying their e-liquid- by dripping directly onto the atomizer with every use. As a result, the rebuildable drip atomizer has remained a popular atomizer choice, and RDA fans are pretty diehard about their benefits. With so many different options to choose from, it can be difficult to determine which rebuildable drip atomizer is the best choice for you. If you're not quite ready to go the route of full-on customization, there are plenty of great pre-built devices out there that you can attach right to your favorite mod to quickly get started. We're going to cover the hottest RDAs in vape tech- the following are the best RDAs in 2019. 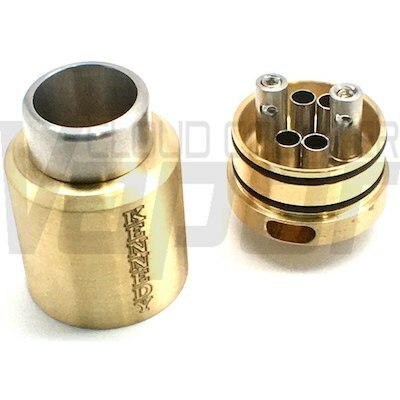 The 25mm two-post is actually an upgraded version of the original Kennedy Enterprises RDA, which sold very well and was highly favored by its fans. The upgraded version gives the device better airflow, a larger well for your e-liquid, and posts that can be switched out for maximum functionality. If you want the best airflow imaginable out of your RDA, then the Kennedy RDA is your best bet. Its intake is incredibly wide, and supplies four airflow passageways inside of the deck giving each coil its own specific air supply. This also helps to keep your device from leaking as much as possible, as you're using up most or all of the e-liquid at once. The unique two-post structure features a pair of copper 2.5mm terminals, making the device diverse and capable of supporting a wide variety of schemes for your coils. The deck can also be swapped out, letting you experiment with even more build combinations; this RDA truly offers the best in customizability. Beyond its broad functionality, it's also a downright gorgeous device. Its steel-plated components are durable, and the casing is laser cut to a super-smooth finish that feels and looks great. Its look is subtle, but versatile. It fits well with the look of practically any hardware setup. The Kennedy RDA Two-Post makes our top-list because it performs well in every category: design, performance, and versatility. 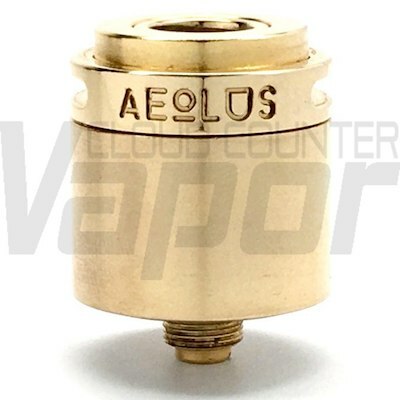 The Aeolus V2 is a great RDA for its price point that's easy to use, making it super accessible to newer vapers looking to try out drip atomizers. Syntheticloud boasts a "signature" vertical airflow system, which passes air over and around the coils, continuing to flow until all of the vapor has passed from the atomizer. This helps keep your RDA clean, with very little residue setting inside of it (and tainting the flavor of your e-liquid). Plus, your hits will be cooler and easier on the throat. Plus, it's got adjustable airflow capabilities. You can switch between the number of open airflow passageways you need so that you can optimize the air resistance and temperature that's best for your vape juice. The V2 improves on its predecessor by offering triple the airflow capabilities. The wide-bored drip tip is super easy to use, and highly leak resistant. The airflow system in the Aeolus V2 flows from the top of the device, discouraging not only e-liquid leakage, but also splashback. You won't have to worry about getting any e-liquid in your face with this drip tip, since the very way it moves air is designed to prevent it. The design is reliable and super durable, being reverse-thread so that it can never get stuck or fused together. And, being built with stainless steel and gold-plated brass, it's super conductive and highly resistant to damage. 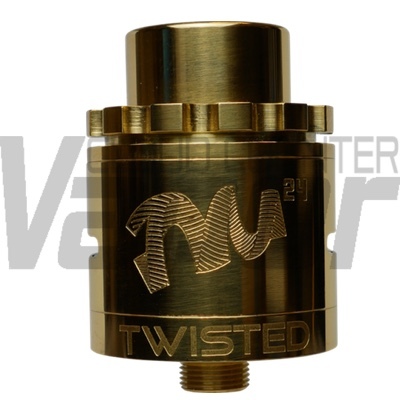 The Pro-Series is an enhanced version of the first TM24 RDA. This tank was already highly sought after for its durability and superior performance, and Twisted Messes has built upon their success by listening to their fans and reworking some of their designs. Of course, it retains many of the features that made the original TM24 a great atomizer. Built from stainless steel, it's a two-post double terminal arrangement with 2.8mm posts (the upgrade? The Pro-Series terminals are squared off). Conveniently, unlike some other devices, you can get right in with a small phillips head or flat head screwdriver. Its air intake gaps are wider than most, coming in at 12mmx2mm. This allows for excellent airflow to the coil, giving this RDA massive cloud production. Plus, your hits will be consistent and clean. The 5.5mm e-liquid chamber lets you get several puffs off of one good drip, and the wide-bored drip tip is easy to use and is super comfortable. The Pro-Series includes a pin for squonking, and you get great hits off of it. Its connections are made from gold-plated brass, making them highly conductive while being reliably long-lasting. The TM24 Pro-Series RDA kit comes with more than just the device itself. You'll also get an ULTEM chamber reducer single coil build, an 810 drip tip adapter (and two different drip tips), and some spare o-rings. For the price, you can't get much better value out of an RDA, especially one that offers the versatility of a two-post configuration. No list of vaping hardware worth its salt could ever leave out dotMod, a premiere vape tech company that's taken the industry completely by storm. Becoming a household name in vaping, dotMod offers top-of-the-line vape hardware for hobbyists of all backgrounds and preferences. 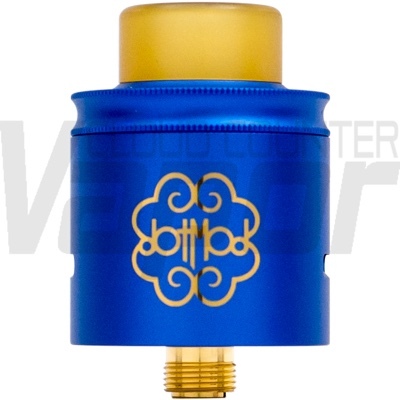 The Dot RDA 24mm is a sleek and slick atomizer with a hard-anodized aluminum & 24-karat gold-plated finish. Just look at the picture- you can even see it shine right on your computer screen! Plus, it's made of solid brass underneath its tough metal finishing, so the dotRDA is extremely durable. This device is an attractive choice, but not just aesthetically - the features are great too. The dotRDA features a 4.8mm juice well, allowing for you to get a good handful of hits before redripping. But that doesn't diminish the benefit of squonking! Its standard 510 contact is bottom-fed to deliver your juice right to the coil, giving you the freshest hits every single time. It's spring loaded for ease of use, and it's got a wide-bored drip tip that's very comfortable on the lips. On top of all that the dotRDA 24mm is specced for single coil or dual coil configurations, and it offers dual-slotted airflow control, giving you plenty of control over the final experience. Few RDAs top the dotRDA 24mm in style and durability. Plus, it's highly functional, and you can count on it to last you a long while compared to cheaper RDAs on the market. Besides the RDA itself, your kit will come with dotMod's "dotKey" screwdriver, a 510 pin built for squonking, two clapton coils (already built and ready to go), some spare parts and o-rings, and a certificate of authenticity so you know you've got the real thing. In simpler vape tanks, the user fills the tank with their favorite vape juice and caps it off. Whenever the device is activated, the juice drips down from the tank, oftentimes through a chamber or passageway to the heating element, and onto the atomizer where it's vaporized. In an RDA, the user applies the vape juice directly to the wick each time they want to use their device. Doing so means that you're always vaping your e-liquid at its freshest. And, since there's not a tank involved, your coil is situated very close to your drip tip. This results in the best possible flavor retention, so each hit offers you the strongest flavor your e-liquid has to offer. And, with a good, clean wick, the flavor will be as close to the maker's intended experience as possible. Not only do RDAs pack more flavor, but they're capable of impressively enormous cloud production. Since there are so few pieces and parts involved in delivering the liquid to the coil, RDAs tend to have great airflow, letting you generate massive puffs to satisfy the cloud chaser in you. Plus, RDAs are more cost effective than full tanks. After all, they simple require fewer parts to put together. As a result, they come at a much more advantageous price point. And, not only can you find super cost-effective pre-built coils, you can even build them yourself! This makes vaping an even cheaper hobby, so long as you're willing to put in a little time to learn what you're doing. NOTE: Always exercise caution when working with batteries and electrical components. Do not attempt to build your own electrical devices without the proper education and training. Being able to build your own coils gives you a full range of customization that you just simply can't get out of prebuilt tanks. Different vapers, and different vape hardware manufacturers, all have their own philosophies about the best orientation for your coils. You can go with just a simple single coil (configured in a number of shapes), multiple coils, clapton coils, twists, and all kinds of other styles. Manufacturers keep tweaking the designs of their coils to try and optimize their devices for the perfect vaping experience. If you're designing them yourself, you can experiment to find out what coil configuration is best for you! Which of our top RDAs have you tried in 2019? Drop us a comment to tell us about your favorite RDAs, and what makes them great!